2018 MHSA scholarship winners were David Thompson (Woodville, WI), Lauren Thompson (Woodville WI), Abigail Braatz (Montgomery, MN), Jonathan Braatz (Montgomery, MN), and Cooper Overn (Carlton, MN). 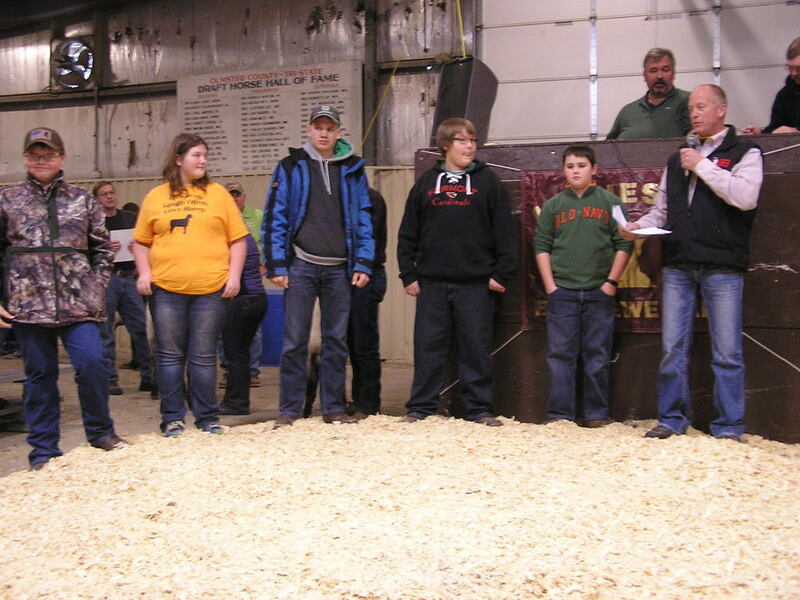 Rod Scheller-MHSA President recognizes the winners, each of who used their $200 sale credit on a registered Hampshire in the Minnesota Bred Ewe Sale. 1st Place January Ewe Lamb and Grand Champion Hampshire Exhibited by the Randy Dombek Family, Ivanhoe, MN and purchased by Mara Quarne, Blair, WI for $1100. 1st Place March Ewe Lamb and Reserve Grand Champion exhibited by Pine Lawn Farm, Holland, MN and purchased by Averi Smith of Spirit Lake IA for $900. Judge Rex Quam (left) studying the first place Hampshire class entries competing for Grand and Reserve Championships at the 2017 Minnesota Bred Ewe Sale. From right, Brood Ewe-Promise Kept Farm, Cannon Falls, MN; Yearling Ewe-Greenway Farms, Beldenville, WI; Fall Ewe-Greenway Farms, Beldenville, WI; January Ewe Lamb-Bobendrier Hampshires, Pipestone, MN: February Ewe lamb-Reid Merrill-Canby, MN; March Ewe Lamb-Highland Hampshires, Harlan, IA; and April Ewe Lamb-Reid Merrill-Canby, MN. Pictured are the five MHSA scholarship winners who purchased ewes at the 2017 Minnesota Bred Ewe Sale. From left: Ericka Lahti of Fergus Falls, MN; Zachary Carter of Starbuck, MN; Lauren Thompson of Woodville, WI; Nathan Thompson of Woodville, WI; and Elizabeth Risacher of Wright, MN. At right presenting the awards is MHSA President Rodney Scheller. The 2017 Minnesota Bred Ewe Sale Champion was consigned by the Reid Merrill of Canby, MN and sold to Greenway Farm (Jon & Laird Mork) of Beldenville, WI for $700. The 2017 Minnesota Bred Ewe Sale Reserve Champion was consigned by the Bobendrier Hampshires of Pipestone, MN and sold to Promise Kept Farm (Tim & Kathy Coss & Family) of Cannon Falls, MN for $825. Judge Rex Quam (left) comments on the first place Hampshire class entries competing for Grand and Reserve Championships at the 2016 Minnesota Bred Ewe Sale. From left, Brood Ewe-Promise Kept Farm, Cannon Falls, MN; Yearling Ewe-Randy Dombek Family, Ivanhoe, MN; January Ewe Lamb-Ram’n Acres, Monticello, MN: February Ewe lamb-Gene & Marci Sanford, Faribault, MN; March Ewe Lamb-Randy Dombek Family, Ivanhoe, MN; and April Ewe Lamb-Reid Merrill-Canby, MN. The 2016 Minnesota Bred Ewe Sale Champion was consigned by the Randy Dombek Family Family of Ivanhoe, MN and sold to Greenway Farm (Jon & Laird Mork) of Beldenville, WI for $1050. The 2016 Minnesota Bred Ewe Sale Reserve Champion Hampshire was a January lamb entered by Ram’n Acres/Rodney Scheller. She sold to Christian Tifft of Spirit Lake, Iowa for $1100. Pictured are the four MHSA scholarship winners who purchased ewes at the 2016 Minnesota Bred Ewe Sale. From left: Bridgette Herrig of Slayton, MN; Zack Peterson of Ellsworth, WI; Nate Bobendrier of Pipestone, MN; and Jared Christensen of Tyler, MN. At right is Tom Bobendrier representing MHSA.